BIO ~ Arya is a female high-content wolf-dog which means she looks and acts like a wolf, but has some dog in her history. We don’t know exactly how old she is but we rescued her in 2012 when she was at least 4 years-old. PERSONALITY ~ Arya has come a long way since her arrival at WSWS. She is not social, but she is steadily becoming more comfortable with people, even occasionally allowing chin scratches! Arya will typically stalk her caretaker around her habitat while they clean, keeping a careful eye on them and everything they’re doing. 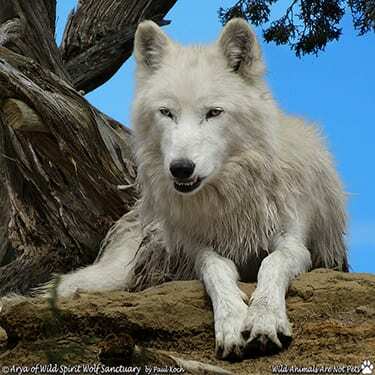 RELATIONSHIP ~ Arya originally lived with four other rescues from Iowa: females Brienne, Lady, Nymeria, and male Ghost. 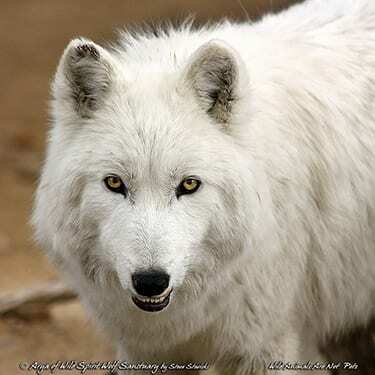 She lived alone after the passing of Ghost and the separation from her sisters due to fighting, but in 2017 she moved in with her neighbor Nakota. They got along well until Nakota joined the Big Pack in the Sky on April 25th, 2018. She is now very happy with her new friend, Chiracowa. LIKES ~ Arya likes following her caretakers around her habitat, staying just close enough to make them a little uncomfortable. She also enjoys scent-rolling on anything that smells interesting and her handsome habitat-mate, Chiracowa. DISLIKES ~ Arya’s can be a bit jealous. She doesn’t like when her habitat-mate gets all the attention, but she also dislikes when all of her caretaker’s attention is directly on her. FUN FACTS ~ Many of our Westeros Pack are hard to tell apart but each has a distinguishing feature. Arya’s bottom canine sticks out so we can always recognize her by her uniquely lovely smile. WISH LIST ~ Our Westeros Pack suffered from malnutrition and have weak bones. We give them all joint supplements and other supplements to keep them as healthy as we can. You can shop directly for Arya and her family from our AmazonSmile Wish List. Howls of thanks for your thoughtful support. Arya is Still Looking for Sponsors! ARYA’S STORY ~ Arya was born into horrible conditions at a breeding facility in Iowa. The original owner/breeder had passed away after a lengthy illness, and her surviving family was having a difficult time caring for the 12 high-content wolf-dogs that she left behind. The breeder had kept her wolf-dogs in 10′ x 20′ cages, some with up to three animals. The cages had cement or plywood floors and only 6-foot-high wire ceilings. Sadly, these are the typical conditions for wolves or high-content wolf-dogs kept in captivity, since these animals can easily dig or climb out of the average yard or enclosure. After the breeder died, no one ever went into the cages and the poor wolf-dogs never went outside. The small enclosures were cleaned with a hose from outside, and years of waste had collected in piles around the edges. No one remembered their names or how they were related. They were not spayed and neutered, so each year more puppies were born. None of them ever survived. A family friend stepped in to try to help take care of the animals and called everyone he thought might be able to help. Unfortunately, no one was able or willing to take on so many animals. Luckily, he didn’t give up and finally called Wild Spirit Wolf Sanctuary. We immediately prepared to make our first trip to Iowa to assess the situation, but before we arrived, the oldest male of the Iowa 12 had passed away. During the assessment trip, we quickly saw how serious the situation was for the remaining 11 wolf-dogs. Wanting to help any way they could, the family generously offered all of their chain link fencing and hardware to help with the building of the Iowa Rescue habitats. Before leaving to return home, WSWS staff loaded Cassie, the oldest female wolf-dog, into the van and took her to Canyon Crossroad Vet Hospital. She received an extensive exam and the immediate care she needed, and then she came home to rest in safety at WSWS. Cassie passed away in the winter of 2012. In September of 2012, WSWS staff went back to Iowa to rescue the remaining 10 wolf-dogs. At midnight, on September 17th, the Iowa 10 stepped foot onto the soil in their new habitats at WSWS. It was the first time they had felt the earth beneath their feet in at least three years! Vet visits revealed they were malnourished, heartworm positive, and had brittle bones and teeth. Due to their age and poor health, we chose not to have some of the Iowa girls spayed, but the boys were all neutered (neutering is often an easier, less invasive procedure with significantly lower risk for the animal). All of the Iowa 10 were given proper medication for their many health issues, put on a healthy diet, and finally received the care they needed. After 3 years with no space to run, they all ran a bit oddly at first, but with time they’ve adjusted to their new life and home. They have all become much stronger and healthier, although they have had some drama due to shifting pack dynamics and further health issues. In the summer of 2013, George R. R. Martin’s wife, Parris McBride-Martin, named all of the Iowa kids after GRRM’s characters from his well-known book series, Game of Thrones. The Iowa 10 are now all known as The Westeros Pack. The Martins have come to visit them and Mr. Martin loaned his star powers to a fund-raiser to build them a brand new habitat! With Mr. Martin’s help, we’ve raised $150,000 to build larger habitats for this deserving family.